The fittings mounting station, designed as a manual working space, is to be set up behind a LEMUTH fittings mounting centre. The manual mounting of the remaining fittings components that have not yet been set on to the preliminary machines takes place on the fittings mounting station. The fitter places the sash on the assembly table and scans it. The image of the sash is shown on the monitor, and the fittings components to be mounted on the sash are graphically represented around the sash. The exact designation of the fittings, the correct storage compartment and the sequence of mounting the fittings are also displayed. Then the fitter mounts all fittings in the specified order and cuts the elongated fittings to their correct length. To do this, the NC dog automatically travels to the exact position where the fittings components - after they have been inserted into the punch - are cut to length and the connection holes are embossed. The machinery of the fittings mounting station can be assembled in stages and can therefore be optimally aligned to the requirements of the production line. The integration of already existing components, for example a cutting-to-length tool or an assembly table, is by all means possible after technical testing. The fittings assembly table has a wide conveyor belt driven by two just as long rollers. Thanks to the conveyor belt the element can be conveniently transported to the machining position without being damaged by manual shifting. When the element reaches its machining position, it is clamped from the top by a clamping unit. With the element being clamped in position, the fittings components can be mounted on the frame piece in an optimum way. An air cushion lifting the wood sash is generated under the glass pane by means of air pressure so that the sash can be turned on the table without any problems. The required air is blown under the glass pane through openings in the conveyor belt. The machining position and the size of the sash to be mounted with fittings are variable as the conveyor belt has several vent holes. The fittings rack arranged over the table provides clearly laid out storage for the elongated fittings to be mounted. It is possible to use a cutting-to-length tool in order to punch and cut all fittings components to be cut to length for mounting on to the drive and top sides of the sash. The numerically controlled dog on the tool sets the cutting gauge specified by the control system each time. The bolting unit consists of an automatic bolting device complete with a bolt sorting and singularising device for one type of bolts. The automatic bolting device is mounted on an easy-glide guide for convenient positioning. The industrial PC has been designed as a monitoring station including a colour monitor and input devices. It uses the latest Windows operating system and has a fittings resolution capability for automation-compatible fittings systems that can be connected. Manual sash clamping station with subsequent bolting by a LEMUTH Automatic Sash Fittings Bolting Machine FBS135. In this configuration the fittings components are clamped by the fitter in the fittings groove and the elongated fittings are cut to the required dimension. Then the follow-on automatic bolting machine bolts all fittings fully automatically. Besides the already known Lemuth solutions for fully automatic sash fittings assembly, an appliance for semi-automatic sash fittings assembly has now been designed. Based on clampable fittings systems, this appliance bolts all preassembled fittings to the sash units. Sash hinges may also optionally be predrilled, set and bolted. The appliance, consisting of a preceding sash fitting clamping station FBK135 and an automatic bolting machine FBS131, is the optimal entry device for automated fittings assembly. The transport and clamping devices of the automatic machines have been designed in a way that is independent of profiles. All screwdrivers can be positioned at different groove position heights. Thus the fittings and profile systems are easy to change. In addition to the independence of fittings, it is also possible to use different screw lengths on one automatic machine. The sash units to be machined can be made of PVC, aluminium or painted wood. The large TFT display shows the respective tasks to be performed by the operator. The industrial PC, which comes with a Beckhoff control, is controlled via a highly intuitive LEMUTH user interface that has been specially designed for this application. Of course this system offers possibilities for remote maintenance to avoid as far as possible onsite service assignments and to help solve problems fast. Various configurations enable every window manufacturer to find an automatic machine that best suits their needs. The material to be machined is decisive for the layout of the machining station. Especially for wooden units, the machining table is equipped with belt drives that ensure the gentle and damage-free transport of the window units. Every automatic machine can be optionally used as a single-station variant or as a pass-through variant. The variants differ in the transport of the finished parts. Whereas with the single-station variant the finished sashes are transported back to the preceding sash fittings clamping station FBK135, the automatic fittings bolting machine transfers the sashes to the following unit such as the stacker equipment AS165 when the pass-through variant is used. 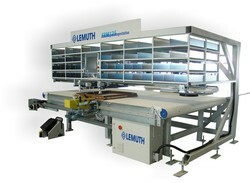 All LEMUTH machines can be used as STAND-ALONE equipment or can be easily integrated into an existing production line. So it is possible that the automatic stacker equipment of series AS165 will be joined after an automatic bolting machine. LEMUTH stackers are available in various configurations and designs. By adding further magazines and handling units the machine can be upgraded to the series FBA136 automatic machine for the fully automatic fittings assembly, which permits the fully automatic mounting of corner guides, sash hinges and interlocking rods in one system. When machining wooden units, an automatic clip setting unit can be integrated for the automatic mounting of the clips used for attaching the aluminium shells. All fittings are clamped by the operator on the preceding sash fittings clamping station FBK135 into the fittings groove of the sash. After the operator has released the unit for machining, the sash will be gently transported by belt drives to the machining position. Wooden units as well as sashes made of PVC are clamped along the entire length of the frame leg against the locating edge. This novel clamping method prevents pressure marks on the sensitive wood sashes. For the machining of large units, additional counterpressure cylinders are provided for the bolting process to prevent any deformation of the frame legs. Then the four servo-controlled high-duty screwdrivers, which can be freely positioned, bolt all fittings simultaneously to all four frame legs. The servo-controlled motors provided at every screwdriver block permit the adjustment of the optimum torque depending on the type of wood and the type of screws used. Overtightened or projecting screws will thus be avoided. The fittings mounting centre FBA-VA cuts, punches and mounts all fittings components to be cut to length, such as drive and top rods, stay guides and interlocking rods, including all connection plates on to the sash. By adding the automated machine on to the rear of a mounting complex for corner guides, interlocking rods and sash hinges, it is possible to fully automatically mount the fittings! Manual mounting errors are eliminated. A stacking device completes the fully automatic sash fittings mounting process. All fittings systems suitable for automation can be processed by the machine. Two feeder towers with 15 feeder chutes each store a total of up to 30 different fittings types. The adjustable feeders can be installed in every system and converted if required. If elongated fittings were up until now manually shortened, the working process now takes place fully automatically in the mounting centre. The grabbing mechanical attachment picks up the fittings component to be cut to length out of the feeder chute and feeds this into the punching mechanism without having to spread them apart beforehand. High-precision numerically controlled axes set up the fittings in the tool to the precise cutting measurement transmitted by the control system. The fittings component is accurately cut to length and embossed. Gentle transportation of the sashes by means of conveyor belts, and rotation of the sashes on a rotating belt table, make these automats ideal for automation of wood- and aluminium window production. The high efficiency of the mounting centre is due to the skilful interaction of working operations which prepare and process. Already whilst the automated machine is mounting the elongated fittings on to the current sash, all fittings components for the subsequent window are cut to length, embossed and pre-positioned onto the loading conveyor belt. Therefore, after the subsequent window has been loaded on, the mounting can commence straight away. The high standards in modern window manufacture are suited to the fittings mounting centre because of its innovative technology. All important transporting of the sub-assembly units are carried out on accurate, fast-acting numerically controlled axes. As a result both bolting devices as well as the mounting operating device can be simultaneously positioned on to the sash using the same sub-assembly carrier. Servo-axes with special features are also used to prepare the fittings. In general, it is possible to set the fittings components on to four different groove position levels. An automatic scanning device is integrated to control the correct bolting-in depth. The machining table has a brush-type surface. In order to turn the sash, a rotator is used. Wooden materials call for particularly careful machining. Consequently, in this configuration, the machining table is equipped with driven conveyor belts. These ensure that the elements are conveyed without risk of damage. During the turning process, the element lies rigid on the driven coveyor belts and the whole machining table turns to the new position.